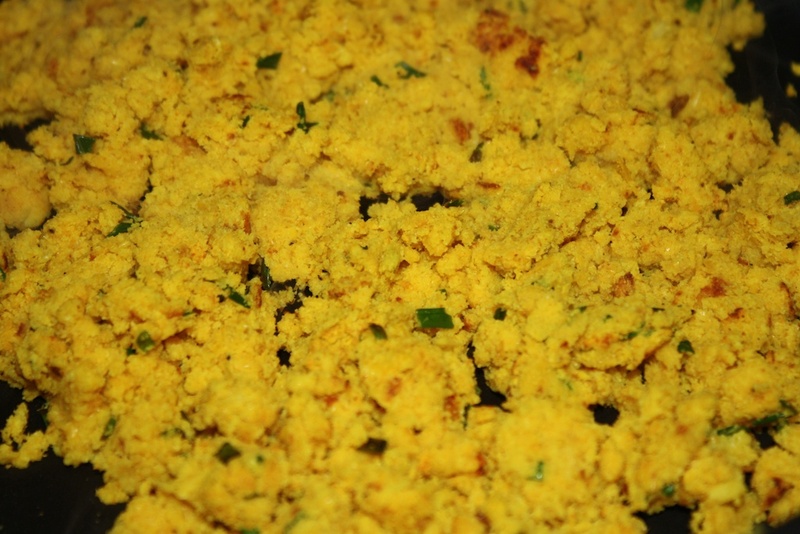 When we previously blogged about making soy milk, and using the soy bean left after straining the milk, biji or okara, for making biji jigae, Sunnie mentioned that I use the biji to make a scramble for breakfast. Several people, including Julia and Katherine asked for the recipe, so here it is! Remember, Biji is very good for you, with tons of protein, calcium and is higher in fiber than tofu. So if you make your own soy milk, you should definitely not be throwing it away. This is an easy and yummy use for biji. I love breakfast food, so it’s something that I really enjoy making. I hope you enjoy it as well. Combine the biji in a bowl with all of the ingredients except the veggies and salt/pepper. Your biji should be quite dry from pressing the soy milk. Mix well. Add the biji mixture and the veggies to a pan with a little bit of oil and cook over medium-high heat, mixing them together and stirring and flipping the biji so that it lightly browns. You can use whatever vegetables you want. We went with fresh chives and some cherry tomatoes from our garden on the side. Cook for 5 – 10 minutes until the vegetables are cooked to the desired tenderness and the biji is lightly browned on both sides. Add salt and pepper to taste and serve with your favorite breakfast sides! The biji will brown slightly, so you will need to turn it over and stir it so that the vegetables cook and the biji browns nicely. Dag. I forgot all about that biji in my fridge. I guess 2 weeks is too long for it to stay fresh and non-poisonous? 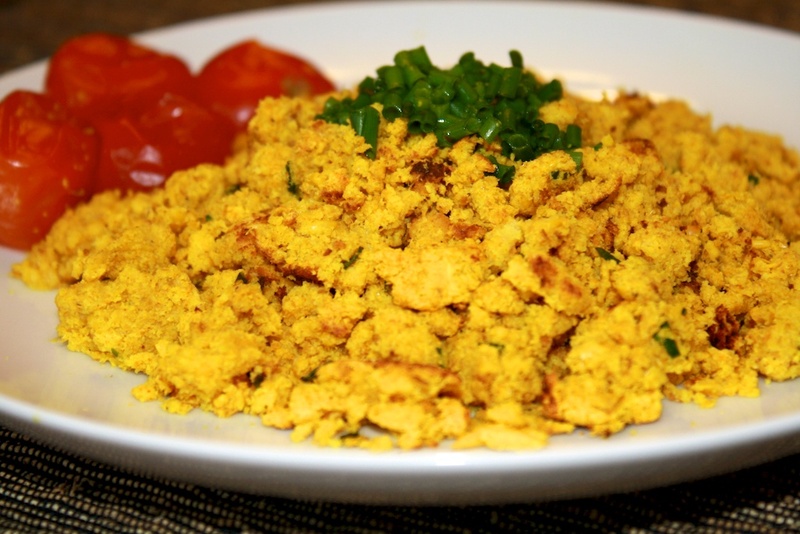 Yes, it’s very similar to scrambled tofu; although, a very different texture of course. We haven’t used biji in baking yet. Keep meaning to, but between biji jigae and scrambled biji, we never seem to have any left for baking! Thanks for the kind words, Kate. I’m so glad you’re enjoying the biji scramble. We’ve got a batch of fresh biji in the fridge right now that I may have to scramble soon. It’s always a toss up of whether it’s going to end up as jigae or a scramble! Looks great! Will try it soon! Do you know how long the biji lasts after you separate it from the soymilk? Thanks for the info. May try this tonight for dinner! My biji isn’t quite pure though (I accidentally added the coagulent to the pot before husband strained it out from the milk….so it is more a mixture of biji and some tofu I guess). I think it should be fine. It’ll be fine. I pretty much use this recipe for scrambled tofu too! Hope you enjoy it!